While browsing David McCorkle’s North Carolina Land Grants for holdings along Gourdvine Creek, I came across a person who didn’t seem to fit the neighborhood. Being the day after the New Year, it was a good and quiet time to explore this person at my favorite place …North Carolina State Archives. My Great-Great Grandfather is David Thomas who married Alice Newsome, the daughter of Christian Barnes and Joseph Newsome originally from Wayne County NC. David and Joseph lived near the mouth of Gourdvine Creek in present day Union County. I remember well the day I found William Barnes also living on Gourdvine Creek. Joseph’s brother-in-law William is Alice Newsome Thomas’ uncle. This was one of those discoveries that reminded me that people have the same needs, they’re bound by family and they’re forever building community. 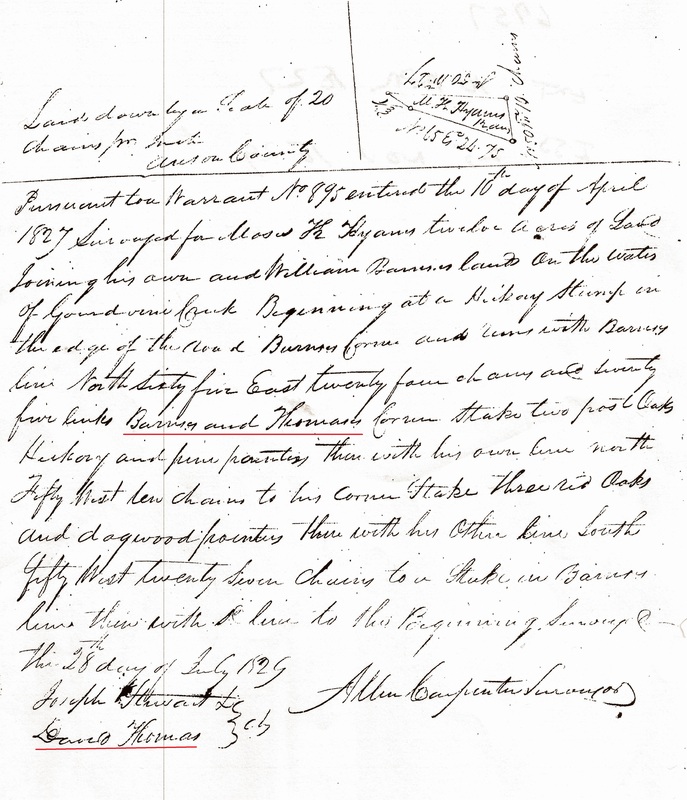 My ancestor, David Thomas served as chain carrier in the 1829 survey (see above) for 12 acres issued to Moses K. Hyams. The survey indicates the land adjoined that of Thomas and Barnes. Looking for more on Moses, I found nothing. So who was Moses? Where did he come from? Born in Charleston SC, Moses Kosciusko Hyams is the son of Samuel Myers Sr and Meriam Levy Hyams. In 1823, Moses K. is listed as Justice of Peace in Charleston. Being a well-documented Jewish family, information on Samuel can be found in Malcolm H. Stern’s First American Jewish Families. From that source we learn that Samuel was the son of Moses and Judith Isaacks Hyams. This Moses was born in Gdansk Poland and had removed to Dublin Ireland and then on to London where he died. The family came to America around 1765. Arriving in Charleston, Samuel is later honored as being the first Jew to settle in Natchitoches Louisiana. It’s there, on 18 Aug 1836, the Thomas’ brief neighbor died in Pointe Coupee Parish. One of Moses K. Hyams’ brothers studied engineering and during his life is credited as surveying much land in Louisiana. The family was involved in building community and as leaders of government. Moses’ brother Henry Michael Hyams also served the State of Louisiana as Lieutenant Governor during the American Civil War. 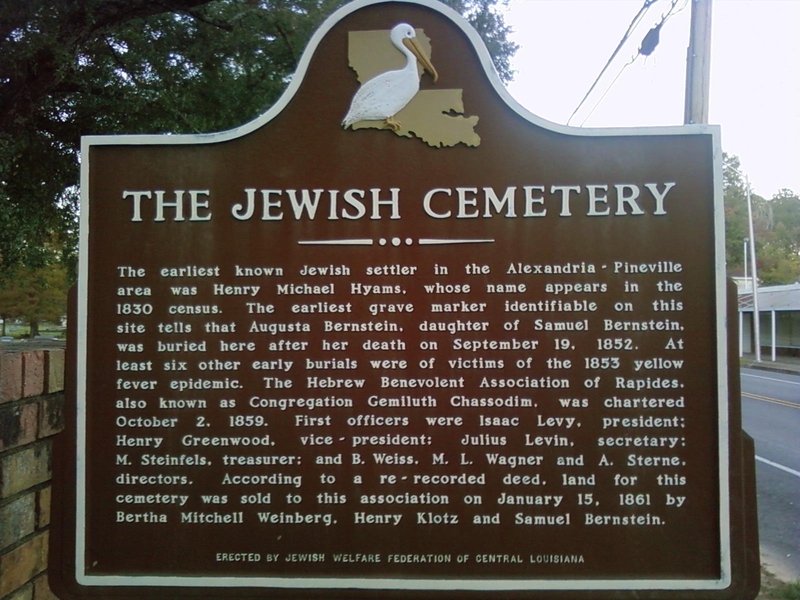 This family established the historic Jewish Cemetery of Rapides Parish and is prominent in the Natchitoches American Cemetery. The men who are good and the men who are bad, As good and as bad as I. This entry was posted in Benjamin Thomas of Anson NC, Thomas, Uncategorized on January 3, 2015 by geothos. John’s daughter, Charity, most likely married a Thomas male from the family of William Thomas (c. 1721-1772) of Amelia County, Virginia, as John owned property within about five miles of this family. The William Thomas line descends from Samuel Thomas line of Gloucester County, Virginia. Charity’s son is also named Samuel. Jeff, don’t know what planet I’ve been on, but this is the first I’ve seen of this post. So, sorry for the late response! You’re right that there’s no way Charity is the same who’s the daughter of John Hymes. But, this Moses is not Hymes, but Hyams …a totally different family. Also, agree that Charity ties to Samuel. I try to address old falsehoods any chance I can. Thanks!